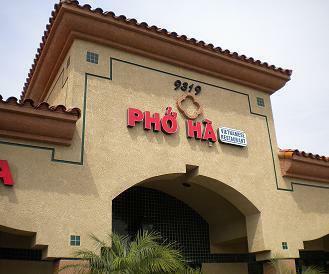 Pho Ha is reputed to be among the best Vietnamese restaurants locally, and none of my experiences there would refute that. The one in Rancho Cucamonga is in the Chuck E. Cheese center. At busy times it’s like a food hall, every table lined up in rows and occupied, a few diners standing and waiting for a seat, waiters scurrying. They do a very good version of pho, the beef noodle soup that is a Vietnamese staple. There’s also an extensive menu of appetizers and entrees, which are what I usually opt for. I’ve never had a bad meal there. The Pomona location is also good, albeit a notch below the Rancho Cucamonga location in ambience. At last count there are 128 reviews on Yelp. David, try Pho Island in Ontario (Archibald & Riverside – Ralphs center), really good soup and sandwiches amongst other things. I went there once — the food wasn’t that great. Didn’t see the “C” rating until after I left. That’s disgusting!! A “C”?!?! ?